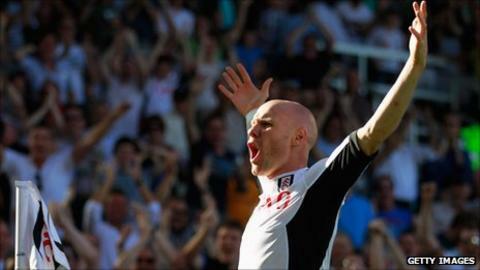 Andrew Johnson scored a hat-trick as Fulham demolished London rivals Queens Park Rangers for their first Premier League win of the season. The striker pounced after Paddy Kenny spilled a shot from Mousa Dembele after 78 seconds, won a penalty converted by Danny Murphy and struck from six yards. After the break he collected a Murphy free-kick before slotting home. Clint Dempsey scored after a flick from Bobby Zamora, who added the sixth with a crisp shot into the bottom corner. Fulham fans will hope the emphatic win will kick-start a campaign which had previously failed to ingite, with four draws and two losses in their opening six Premier League fixtures. The first Premier League hat-trick by a Fulham player was taken in fine style, but it also exposed a slack defensive display which left QPR manager Neil Warnock fuming on the sidelines. The tone was set in the second minute when Johnson netted the quickest goal in the Premier League so far this season, when Kenny was unable to cling on to Dembele's shot and the former Everton striker was first to react. The lead was doubled soon after thanks to more good work from Johnson, who battled through to the edge of the box and was clumsily brought down by Kenny - and Murphy stepped up to score. Johnson, who scored twice in the Cottagers' Europa League win over Odense on Thursday night, has at Craven Cottage - and his performance here will have done his position in negotiations no harm. He grabbed his second seven minutes before the interval, firing home smartly from six yards out after Zamora's cross. Johnson's hat-trick goal on 58 minutes summed up the visitors' lacklustre showing as he latched on to a cleverly taken free-kick from Murphy and darted through to score. He then played a crucial role in the fifth, crossing from the left to Zamora who flicked back deftly to allow Dempsey to net. And Zamora completed the rout himself, lashing in from the right-hand side of the area past a helpless Kenny. Warnock had gone into the clash hoping to see his side record back-to-back away wins in the top flight for the first time since 1995, but the only positive note for the visitors was the return of striker Jamie Mackie to first-team action for the first time since his double-leg break in January.